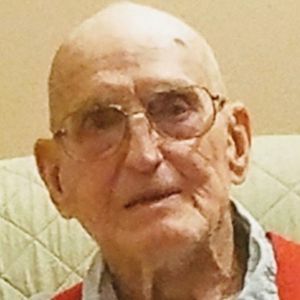 ANDERSON- Joseph E. Kinnard, 101, died March 30, 2019 at Community Hospital in Anderson. He was born March 10, 1918 in Madison County, Indiana and was a lifelong resident. He was a lifelong farmer as well as being employed at Delco Remy for several years. He was a 1936 graduate of Pendleton High School. A navy veteran of World War II, as a Seabee in the Naval Construction Battalion he served 22 months in the Pacific. He was a 77 year member of Madison Masonic Lodge No. 44 F.&A.M., Pendleton where he was the oldest member. He was a member of Indianapolis Valley of the Scottish Rite. He was a member of Pendleton Lions Club and served as an EMT with Pendleton Emergency Ambulance Service. Survivors include daughter, Ellen (husband, Brian) Shaw of Anderson; grandson, Chris (wife, Lauren) Shaw of Rittman, Ohio; great grandson, Caleb Joseph Shaw; granddaughter, Tara (husband, Josh) Mawbey of Wisconsin Dells, Wisconsin; and great granddaughter, Lillian Mawbey. He was preceded in death by his wife, Eva I. (Givens) Kinnard; and parents, Morris Hardy and Edith Hortense (Brattain) Kinnard. Services at 11 a.m., Friday, April 5, 2019 at Wilson St. Pierre Funeral Service and Crematory, Lahm Chapel, 211 E. State St., Pendleton, Indiana 46064 with Pastor Doug Walker officiating. Burial will follow in Grove Lawn Cemetery, Pendleton. Visitation from 4 to 8 p.m., Thursday, April 4, 2019 and 10 to 11 a.m., Friday, April 5, 2019 at Lahm Chapel. A masonic memorial service will be conducted at 7:30 p.m., Thursday, April 4, 2019. Memorial contributions may be made to Madison County 4-H or Pendleton Lions Club.